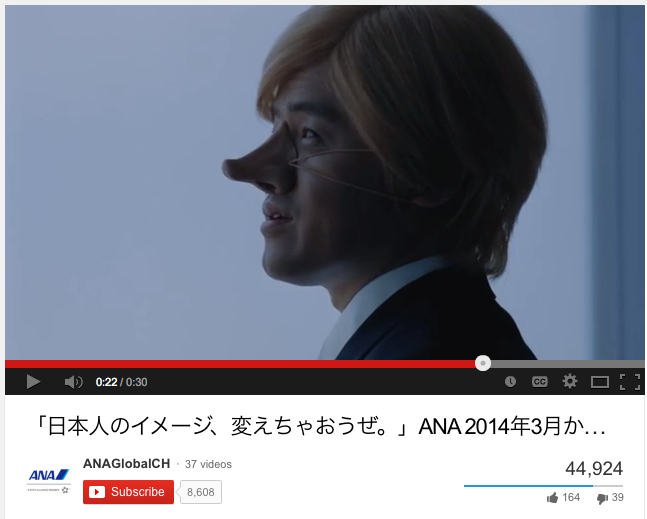 Making headlines recently has been a commercial by ANA, one of Japan’s flagship airlines. Released last Saturday, its 30-second spot shows two Asian men (one a comedian named Bakarizumu, but let’s call them A and B) standing at an airport window speaking English with Japanese subtitles. Looking out at the jets, A says, “Haneda Airport has more international flights nowadays.” B replies, “Finally.” Then their exchange goes, “Next stop, Vancouver.” “Next stop, Hanoi.” “Exciting, isn’t it?” Then B says, rather oddly, “You want a hug?” When A only gives him a nonplussed look, B continues, “Such a Japanese reaction.” When A explains, “But I am Japanese,” B counters, “I see. 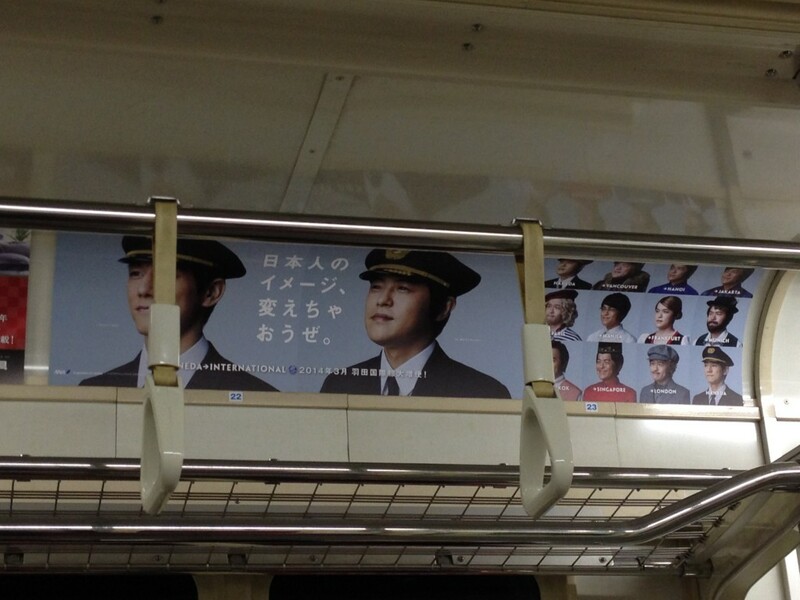 Let’s change the image of Japanese people.” And A, smiling broadly, agrees to it. Alright so far. 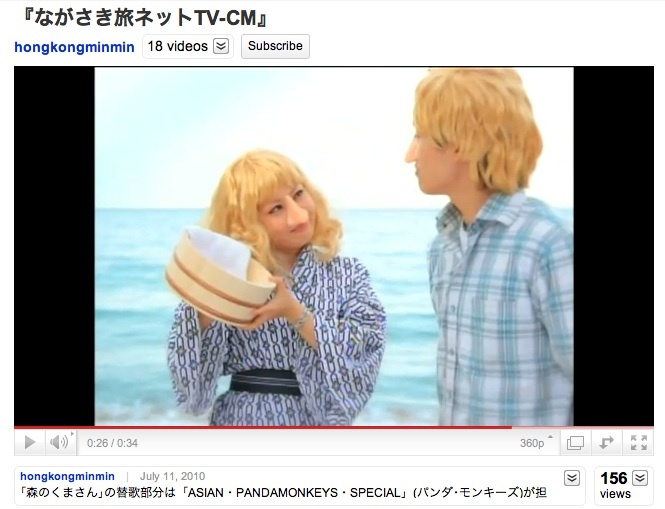 Except that, as you can see in the picture below, A is now wearing a strapped-on long nose and a big blond wig. Off they fly to their destinations. This has occasioned considerable debate and media coverage. 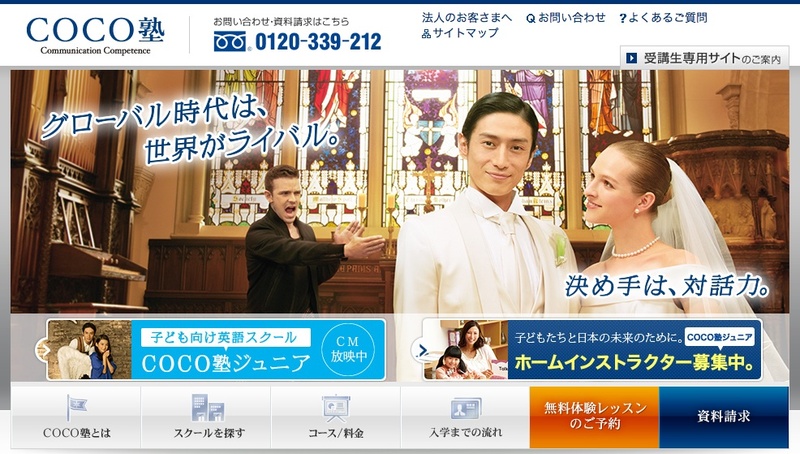 Many commenters in the English-language online forums have called this advertisement “racist” (one even said “Debito bait”; I’m chuffed), and have made motions to take their business elsewhere. 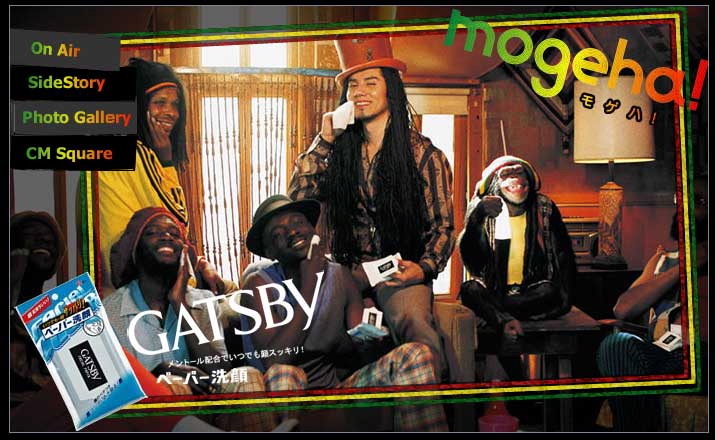 Others have said the advertisement isn’t racist, just lame. A few managed to find a deep pocket of latent irony, saying it’s actually poking fun at the Japanese people and their insular attitudes. 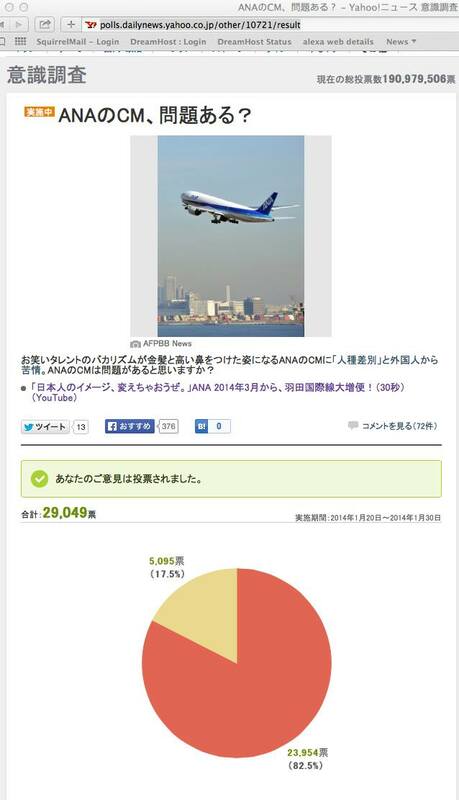 Meanwhile, within Japanese-language forums, according to a Yahoo Japan poll, 82% of respondents see no problem with it. It probably comes as no surprise to you that JBC objects to this ad. 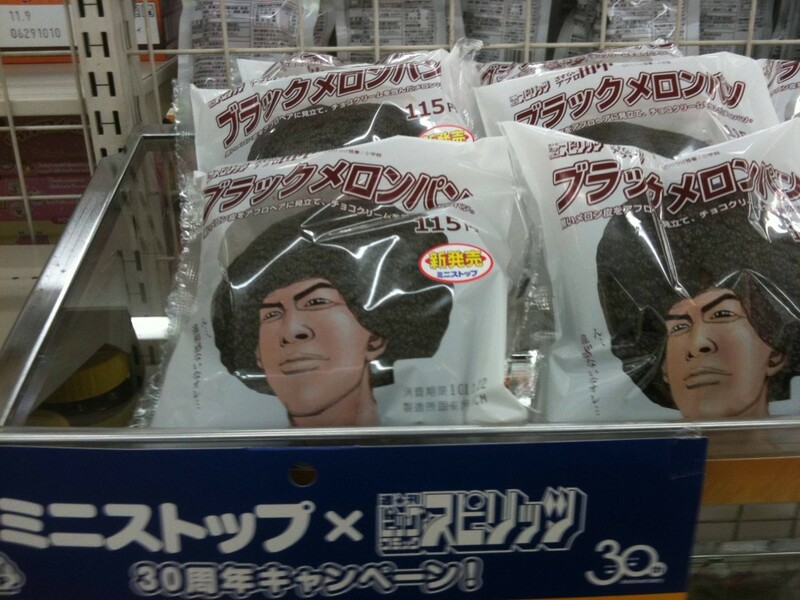 If ANA had really wanted to “change the image of Japan,” it should have avoided racializing their product. Instead, it’s just business as usual. 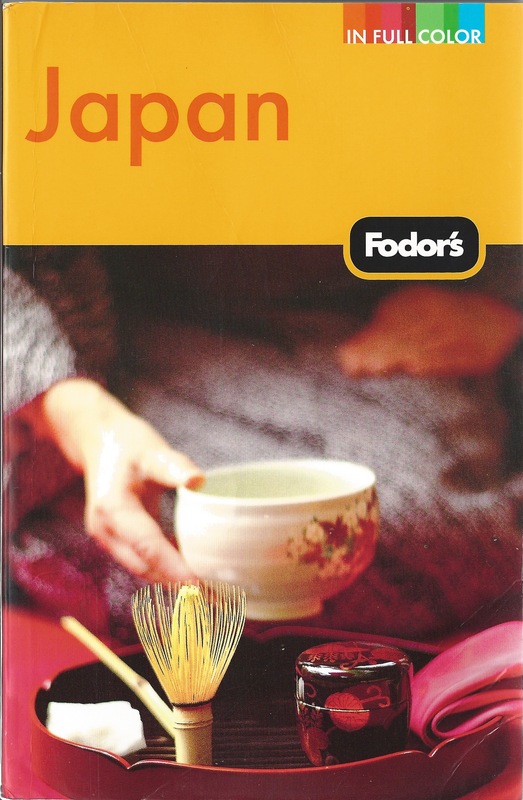 And how about the Choya plum saké commercials in 2008, featuring three girls (two Caucasian, one Japanese), the latter sporting a big plastic nose and stick-on paper blue eyes? 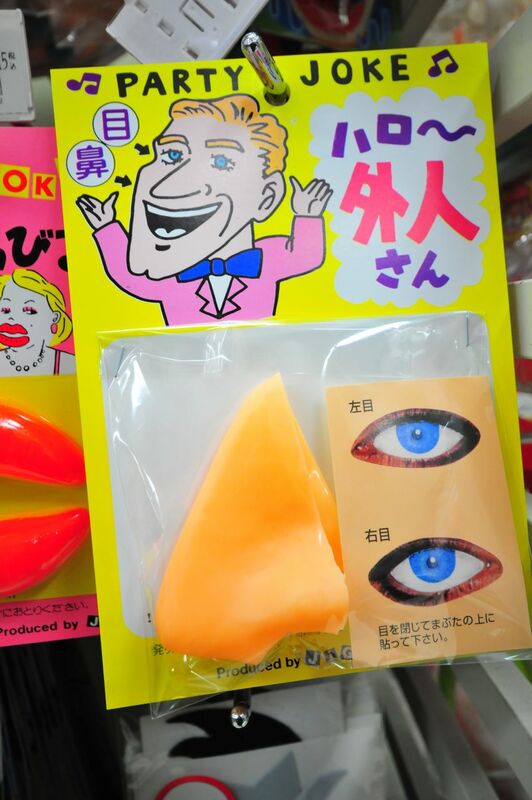 Although most of these ads were soon pulled after complaints, you can still go to Amazon Japan or Tokyu Hands and buy your own “gaijin” stick-on blue eyes and nose (with the caption “Harō Gaijin-San”) to sport at parties! Har har. Can’t you see it’s all just a joke, imbued with a deep sense of irony subversively directed at Japanese people? Except that, as I’ve pointed out in JBCs passim, irony as humor is not one of Japan’s strong suits. 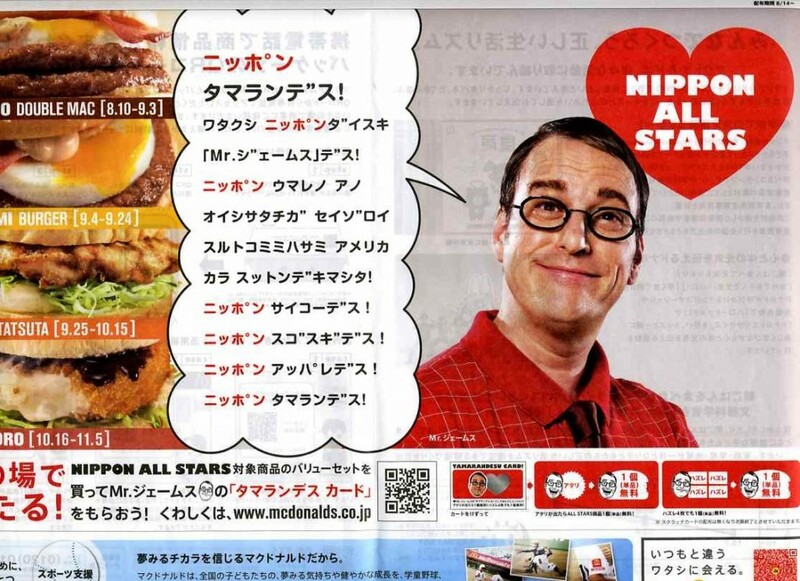 Moreover, remember when McDonald’s Japan was using a nerdy white guy to hawk newfangled burgers? 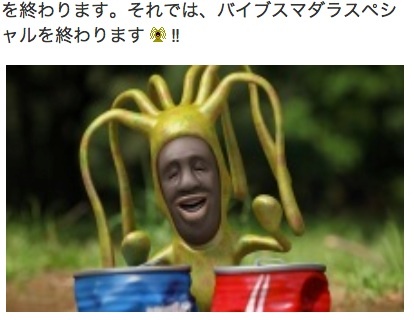 JBC argued (“Meet Mr. James, Gaijin Clown,” Sept. 1, 2009) that stereotyping of this nature only works as humor if, among other things, there is a “switch test” – i.e., everyone is fair game for parody. But in Japan it’s not fair game. 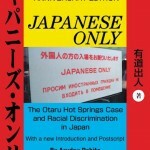 Japanese society and media takes quick umbrage to being lampooned by the outside world, especially in a racialized manner. Case in point: To commemorate the publication of “Little Black Sambo,” I drew up a parody called “Little Yellow Jap” to put the shoe on the other foot (debito.org/chibikurosanbo.html). I made the protagonist as stereotypically exaggerated as the ink-black gollywogs in the book: bright yellow skin, round glasses, buck teeth, and clad in a fundoshi loincloth. I pointed out on every page that this was a parody of Japan’s Sambo, and contextualized it with a full explanation in Japanese of why racialized books for children are bad. Yet for years now in the Japanese version of Wikipedia’s entry on me, this parody is cited as an example of my “discrimination against Japanese.” Clearly turnabout is not in fair play. In tepid apology letters, ANA uses the standard disclaimer: “We didn’t mean to offend anyone.” Okay. And I’m sure many of your potential customers didn’t “mean” to be offended either. But many were. And if you have any pretentions to being an international company, you wouldn’t get in these sticky wickets in the first place. Nevertheless, ANA deserves its lumps, because reps simply don’t know what they’re apologizing for. In fact, they clumsily reinforced the binary, stating in press releases that complaints have “mostly come from foreign customers” (as opposed to real customers? ), before finally pulling the ad last Tuesday. So… “global citizens” equals White people? Now the ad is even more problematic. “Dear ANA: Are you aware that most of your foreigner customers are from places like Seoul, Shanghai, Taipei, Hong Kong, Singapore, Manila, and Kuala Lumpur? And that most of them probably don’t have blond/orange hair? 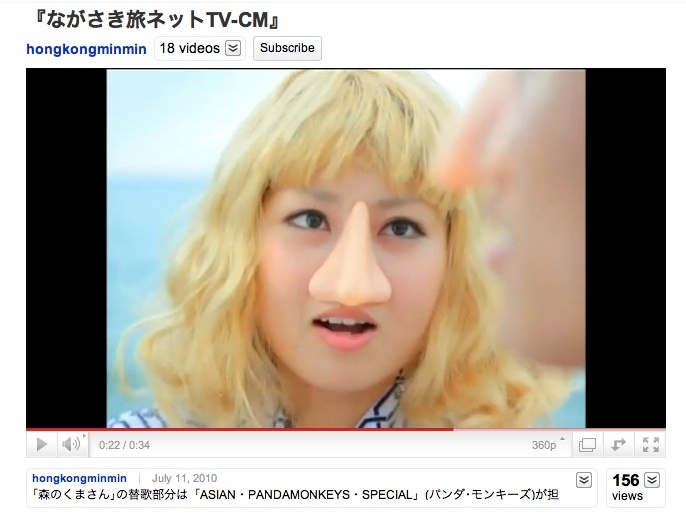 Oh, and even the ones with blond hair probably don’t have noses like a tengu goblin. And pretty sure that Japanese people enjoy being hugged and have emotions. Well, at least the Japanese who aren’t sticks-in-mud CEO boardroom types with no sense that the world doesn’t really resemble their 19th-century, ‘we are so different from you funny-looking white gaijin’ Meiji-Era mentality. Touché. Look, Japan, if you want to host international events (such as an Olympics), or to have increased contact with the outside world, you’ll face increased international scrutiny of your attitudes under global standards. Only when Japan’s business leaders (and feudalistic advertisers) see NJ as a credible customer base they could lose due to inconsiderate behavior, there will be no change in marketing strategies. NJ should vote with their feet and not encourage this with passive silence, or by double-guessing the true intentions behind racially-grounded messages. Hi Blog. In what I consider to be good and very significant news, the Tokyo District Court ruled that NJ who had their privacy violated, due to National Police Agency leaks of personal information, were entitled to compensation. UPDATE JAN 17: I was convinced by a comment to the Japan Times yesterday to remove this entry from the “Good News” category. I now believe that the court approval of official racial profiling of Muslims has made the bad news outweigh the good. That comment below the article. The Tokyo Metropolitan Government has been ordered to pay compensation of more than 90 million yen, or about 860,000 dollars, for breach of privacy resulting from a leak of police documents. The case involves 114 documents related to international terrorism that were leaked online in 2010. They contained the names, addresses and photos of Japanese people and foreigners who provided information to police investigators. About 2 months after the documents were leaked, the Tokyo Metropolitan Police Department acknowledged the documents as their own, and pledged protection and support for those whose identities have been revealed. But the police were never able to identify who was responsible for leaking the documents, which was done with special software that made the leak untraceable. The statute of limitations on the case expired in October. On Wednesday, the Tokyo District Court ruled in a lawsuit filed by 17 Muslims who claimed that their privacy had been violated. Presiding judge Masamitsu Shiseki acknowledged that the police created the documents and called intelligence-gathering by investigators an unavoidable measure to prevent international terrorism. But the judge said the documents were probably leaked by Tokyo Metropolitan Police Department personnel, and held the Superintendent-General responsible for failing to properly manage their intelligence. One of the plaintiffs told reporters that he felt a bit relieved that the court acknowledged the responsibility of the police. But he said that what he and others really wanted the court to acknowledge was that the police investigation was discriminatory and illegal. He said he was sorry that the court did not find the investigation illegal. The Tokyo Metropolitan Police Department says it is regrettable that the court did not accept its claims. It also said it will decide whether to appeal the ruling after studying the content of the decision. 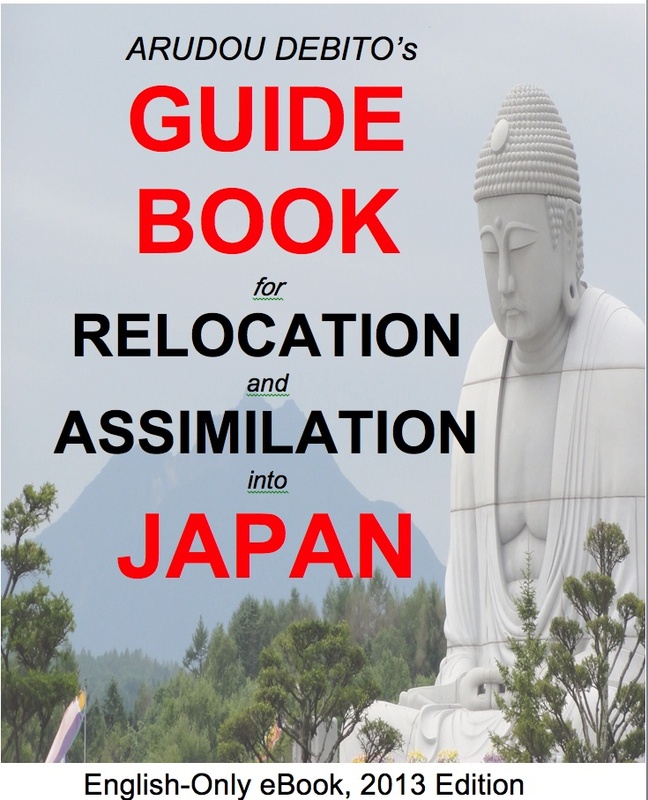 So, the Japanese court has legally sanctioned the government to racially profile its Japanese citizens and residents, by giving the Japanese government its official approval and permission to racially profile them based on their religious beliefs. This smacks of the early days of the rise of Nazism, when the Nazis racially profiled Germany’s Jewish population based solely on their religious beliefs. The Japanese court has ruled that the police can gather information on Japanese citizens and residents, based solely on the reason that they are Muslim. It cited that terrorist attacks had been carried out by Islamic radicals around the world, and the ruling stated that, “There is a sufficient danger that such acts could also occur in Japan”. Never mind, that these muslim citizens and residents have committed no crimes, have nothing to do with terrorism, and that until now Japan has only experienced home grown terrorism, which has nothing to do with its muslim population. Posted on January 6, 2014 March 11, 2014 by Debito Arudou Ph.D. Happy New Year to Debito.org Newsletter Readers! 2) Best of 2013: What do you think were the most important issues/events affecting NJ in Japan? 4) Holiday Tangent: Debito.org cited in Cracked.com! You know things are really getting serious when the Old Grey Lady starts doomsaying. After a milder editorial last April, the NYT has broken the news about Japan’s Extreme (I think we can call it “extreme” without hyperbole) Rightward Swing in an editorial last month. And it does it without worrying about allegedly imperiling “The Relationship”, the typical excuse for pulling punches when it comes to criticism of Japan (e.g., avoid “racist Japan bashing”, and protect our closest ally, hitherto largest sales market outside of the USA, and most successful American-reconstructed Postwar country in Asia). The NYT now sees the “danger” (and calls it that). It’s time for people to start considering the PM Abe Administration as a regional security risk, and — Dare I say it? Yes I do — drawing up contingent strategies of containment as one would China. This is where we’re heading in 2014. The longer the world averts one’s eyes to Abe’s true intentions over the next two years, the worse it will be for the Japanese, and for Japan’s neighbors. NYT: The government of Prime Minister Shinzo Abe this month rammed through Parliament a state secrecy law that signals a fundamental alteration of the Japanese understanding of democracy. The law is vaguely worded and very broad, and it will allow government to make secret anything that it finds politically inconvenient. Government officials who leak secrets can be jailed for up to 10 years, and journalists who obtain information in an “inappropriate” manner or even seek information that they do not know is classified can be jailed for up to five years. […] Mr. Abe’s aim is to “cast off the postwar regime.” Critics in Japan warn that he is seeking to resurrect the pre-1945 state. It is a vision both anachronistic and dangerous. I found this tasty website on TIME Magazine, showing that other famous Americans have chosen to relinquish their US citizenship. Think singers Tina Turner and Maria Callas, film directors John Huston (AFRICAN QUEEN and MALTESE FALCON) and Monty Python animator Terry Gilliam, actors Jet Li and Yul Brynner, performers Yehudi Menuhin and Josephine Baker, writers T.S. Eliot and Shere Hite, politicians Valdas Adamkus (Lithuanian President) and Andreas Papandreaou (Greek PM), and businesspeople Earl Tupper (of Tupperware) and Eduardo Saverin (co-founder of Facebook — yes, the guy with the chicken problem in the movie SOCIAL NETWORK). 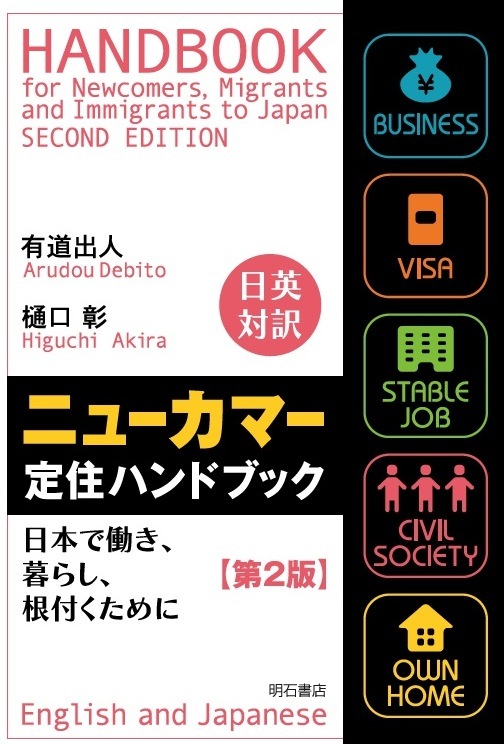 As the year-end holidays approach, Debito.org usually puts up topics that are more tangental and less serious. As Japan is going through something I consider to be very serious (a return to Prewar values and political systems), this is hardly the time, but I think I’ve said so far all that one needs to say about the issues for now in previous blog posts. So today, let’s look at a site that I have become quite a fan of: Cracked.com.